We are pleased to welcome Ivan Amato as a guest correspondent. Ivan is the author of the wonderful book, Super Vision: A New View of Nature. A century ago, some of the best scientific minds were still debating whether atoms actually existed. Although atoms had long been a fabulously useful concept for making sense of chemical and material phenomena, no one had actually seen them. Their existence always was inferred, not confirmed by way of direct observations. Even so, well before World War I, almost all scientists believed that atoms were real. Since then, microscopists and instrument designers have been inventing ever more clever ways to visualize the material world on ever finer scales. For years now, scientists have been using tools with names like scanning tunneling microscopes (STM) and high resolution transmission electron microscopy (HRTEM) to image the regimented geometry of crystalline samples’ constituent atoms. It has been way easier to image individual atoms of the heavier elements of the periodic table, such as tungsten and gold, compared to the atoms of lighter elements. Hardest of all has been imaging the lightest and smallest atoms of all, among them hydrogen and carbon atoms. These are the atoms most associated with life and with the biological chemistry that underlies life, which is why atomic-scale imaging has largely been the province of physicists and materials scientists who make products such as industrial catalysts and semiconductors. A team of researchers at the University of California at Berkeley, led by physicist Alex A. Zettl, has found a way to use a standard-issue transmission electron microscope (TEM) to visually discern individual atoms of hydrogen and carbon. A small number of these atoms that were lingering in the TEM’s sealed and evacuated sample chamber had drifted onto an atomically thin sheet of graphene–a molecular grid of carbon atoms in the geometry of chicken wire-that the researchers had placed inside the chamber. In the image shown, to which the researchers have liberally applied image processing tools to produce the colors, the hydrogen atoms appear as green dots amidst a speckling of blue, which essentially is background noise due to the graphene. A lone red dot, with an arrow for extra emphasis, marks the location of a single carbon atom. In a more raw form, the data from the TEM appears as squiggly traces that indicate how much a beam of electrons impinging on the sample scatters as the beam hits different locations of the sample’s microscape. A computer then transforms this scatter intensity data into a two-dimensional, black-and-white pictorial image that corresponds to the sample’s atomic landscape. 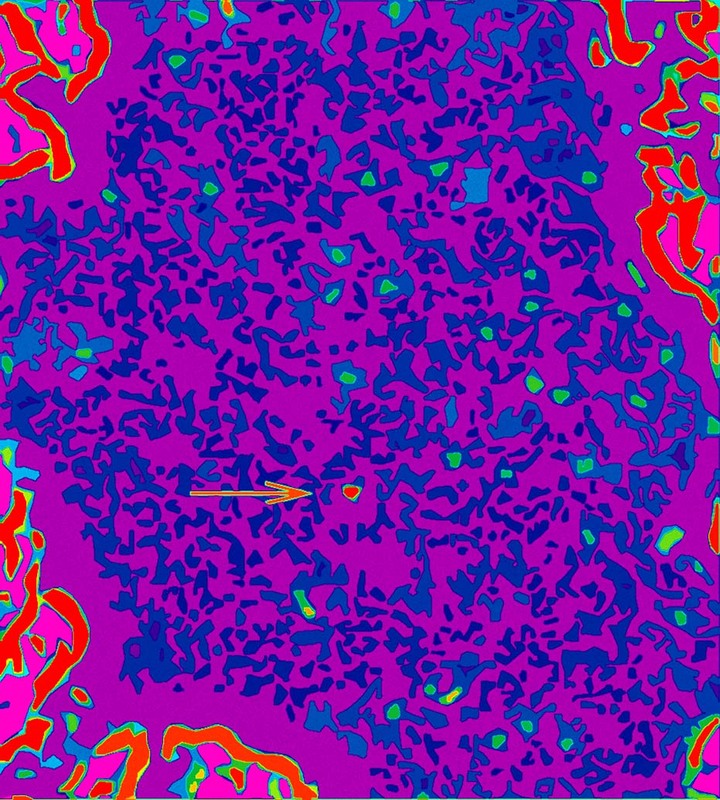 Then, with additional image processing requiring the applications of aesthetic judgments, that is, choosing colors, the original data finally becomes the abstract “painting” seen here, a painting that harbors what appears to be scientists’ first glimpses of individual hydrogen atoms by way of TEM. Unlike directly seeing a flower in your garden or the web page you are viewing by way of your own eyes and brain, “seeing” atoms requires mediation–a TEM, a computer, and image processing tools-to render what is otherwise invisible visible. Yet, eyes and brains also mediate our seeing. They constitute evolution-honed instrumentation that senses photons from objects and processes these signals in a way that we experience as seeing. Directly seeing with eyes, then, might be thought of a singly-mediated seeing, whereas using tools like TEMs might be thought of as doubly-mediated seeing. Credit for image: Courtesy Zettl Research Group, Lawrence Berkeley National Laboratory and University of California at Berkeley. The Zettl group just published, in Nature (vol. 454, pp. 319-322), their first paper on the technique. The image above is not in the paper but is available at their web site. Next Post →Sight Gag: No Joke! Very, very cool! I stumbled on your site recently and am enjoying the great writing and images. Keep it up!